Ocean Pier IV is a fun North Myrtle Beach resort that is situated right on the oceanfront in the Windy Hill section of North Myrtle Beach, South Carolina. All of the North Myrtle Beach vacation rentals at Ocean Pier IV have ocean views. An oceanfront swimming pool is a pleasant feature of this North Myrtle Beach resort. And the accommodations at Ocean Pier IV you will find to be most comfortable. So make reservations today for a North Myrtle Beach condominium rental at Ocean Pier IV in North Myrtle Beach, South Carolina. This North Myrtle Beach resort boasts many features that you will likely appreciate. In addition to the oceanfront swimming pool with an oceanfront sun deck and easy beach access, this North Myrtle Beach resort has an area on site designated for grilling. Have you ever thought of having a family barbecue at the beach? Ocean Pier IV makes it a possibility. And with all of the seafood markets in close proximity to this North Myrtle Beach resort you can grill up some delicious seafood and freshly caught fish during your North Myrtle Beach vacation. There is also covered parking at Ocean Pier IV. This North Myrtle Beach resort is a three-story oceanfront retreat that is built on stilts. So there is covered parking on the ground level, immediately underneath the North Myrtle Beach condominiums. Three sets of stairs lead from the parking areas up to all three levels of this North Myrtle Beach resort. Please note that there is not an elevator at this North Myrtle Beach resort. With an oceanfront swimming pool at Ocean Pier IV you will just want to be outside all the time. Enjoy the sound of the waves crashing ashore as you lounge poolside. Keep cool under the hot summer sun by slipping into the sparkling blue water of the swimming pool and floating around leisurely. Lounge chairs dot the sun deck so you can rest comfortably, so comfortably that just might take a cat nap while you are by the pool, an excellent idea for every North Myrtle Beach vacation. There are a number of North Myrtle Beach vacation rentals at Ocean Pier IV from which your family can choose. Each condo in North Myrtle Beach, South Carolina has two private bedrooms and a sleeper sofa in the living room. All of these North Myrtle Beach condominiums sleep up to six people for one amazing North Myrtle Beach vacation. These two-bedroom, two-bath North Myrtle Beach condo rentals are nicely furnished. You will find a well equipped kitchen in each of these condos in North Myrtle Beach, South Carolina. Keep your drinks icy cold in the full-size refrigerator. Make eggs and bacon for your family first thing in the morning with the stove top in these North Myrtle Beach condominiums. The dishwasher makes for easy clean up so you can get out to the pool or go for a walk on the beach after breakfast. 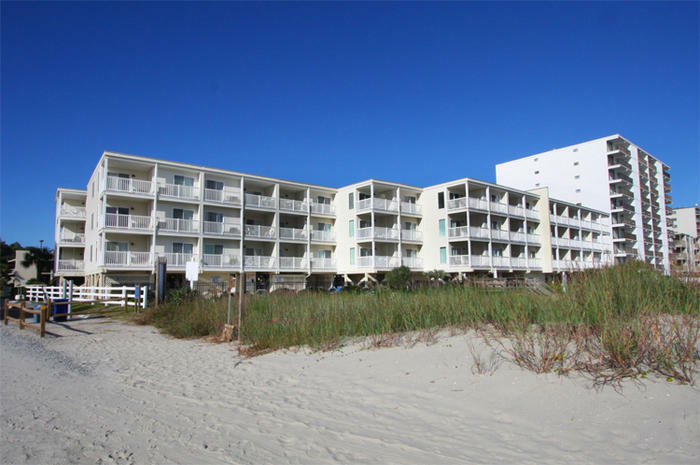 Elliott Beach Rentals is not affiliated with onsite management or the HOA of Ocean Pier Iv.